The following excerpt is from Emily Robert’s Express Yourself: A Teen Girl’s Guide To Speaking Up and Being Who You Are. Snap, hashtag, post, like, share, ask, gram–you know the drill. All of these fun and exciting ways to connect on social media make it almost impossible to put your phone down. When your gadget is controlling you, you are not in control. But approaching your phone or keyboard with assertiveness requires you to do one thing your mind is not always good at: pressing the pause button. Being behind a screen gives people a sense of power while blinding them to the effects of their mean comments or of their desire for attention. How do tap into your assertive mindset when your fingers are doing the talking? Well, in order to figure it out, you need to pause and know your rights on social media and online with these quick tips and tricks. Even though it sometimes doesn’t feel like it, you have have your rights online. These are the things you are allowed to do and say. Before you get online, remember these rights. You have the right to create, share, and express yourself online. You have the right to keep passwords and personal information private. You have the right to respond to messages online and through your phone when it’s convenient for you. You have the right to make friends online, but you don’t have to meet them in person. You have the right to unfriend, delete, and block people on social media. You have the right to refuse a friend request if you don’t know the person or don’t want to be friends with him or her online. You have the right to be treated with dignity and respect online–you can, and should, report users who do not treat you this way. You have the right to keep your personal information private–you don’t have to share your journal, address, or pictures you don’t want to go viral. You have the privilege of using technology. But it can be taken away if it’s not used respectfully. 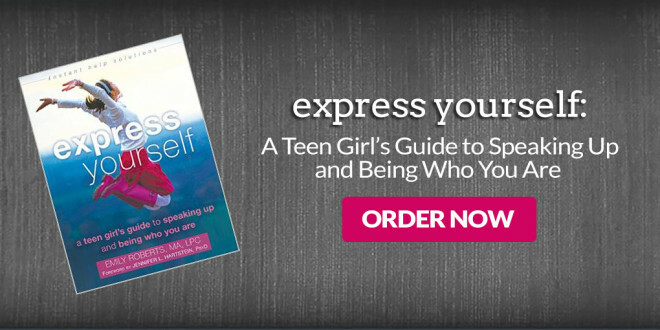 For more tips and tricks, read Express Yourself: A Teen Girl’s Guide to Speaking Up and Being Who You Are.